501st Unit:None as of yet. Danegeld, I know that pain. I've been searching for the right armor for myself, and from what I've learned, RT-Mod is the way to go for us 'stouter' individuals. Keep in mind though that I'm still very new to this and am still doing my research. Hi guys, AM has plenty of extra material in the moulds, just helped a local member put one together. He is one big unit at 6'5"and very broad shoulders . Still needed to shim his mid section but he looks awesome, intimidating in fact. When all other TK,s have fallen, we bring out "Goliath"
Does the same hold true for Bucket sizes? I have a legion mate that has the old FX full set, but he wants to upgrade the helmet to todays Legion standards. Is RT the way to go? He has a very LARGE CRANIUM! I have AM right now and it fits width-wise well enough but it's waaaay too tall for my 5'8" frame. AM or RT-Mod are good options for larger TKs. I wear an RT-Mod kit, and I am 6'2", 220lbs. AM2 is HUGE.. in a good way.. no shimming for 80% of larger body types.. the MTK Breastplate literally fits inside of mine. perfect for us "less than perfect" body types.. I'm 5'11 and 215lbs and it fits me perfectly. Good to hear. I have about an inch and 10-15lbs on you. My AM 2.0 gets here on Tuesday. Excited and terrified. 6'1 220lbs, still waiting on a reply from troopergear. Going to inquire to to RT-MOD today. It's probably a perfect time to contact Rob (RT). He usually fills his annual lists up ahead of time, and that's it for the year. I contacted him in April of 2013, and was approved in my RT kit in April of 2014. He's a great guy to do business with, and makes a very nice kit. If you have any questions before you potentially order from him (or go on his wait list really - because he'll have one) shoot me a PM, and I'll help you out as best as I can. I'm glad to see this post. In spite of how old its origins are. 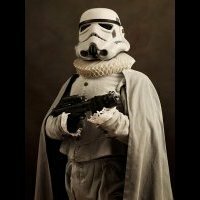 I'm looking into armor kits, and the biggest issue I have is I am not the size of the average British actor that filled the roles in Star Wars. At 6'1", and 275 lbs (and trying to lose about 30-40 lbs for health reasons), even though I carry it fairly well, except for the spare tire that my ex-wife said I carry "too well", I was thinking finding armor in my size is going to be the biggest challenge. That being said, I'm glad I'm not the only one out there with this issue, and even more glad to see that there are at least a few places where "Big Boy" (or Girl) armor can be acquired. Thats that was a big help with the comparsion pics I pre-order a ANOVOS Trooper and now getting worried Shadow Trooper has anyone seen this new company? I do wonder if my aim to become a trooper is a bit of a pipe dream. I'm gradually losing weight although at the minute I'm a waist size 50. I wouldn't dream of considering buying armour yet, although I have read to look 'right' I'm going to need to get down to a 34inch waist, is that about right. I want to light right as a trooper...not just some big guy wearing armour. Hi Tom. So I wouldn't say that your goal of becoming a trooper is a pipe dream. It is a dream that many of us have and some people have gone to great lengths to make it happen. So it doesn't always come down to your waist size. It also comes down to your body type, your height, weight, size of your arms, size of your legs and other factors. I know of members who are a size 34 waist but like to work out a lot have have trouble fitting their arms in the armor. 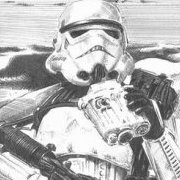 Anyway, there are a couple of sets of armor that are geared toward the larger trooper. The first one that comes to mind is AM2.0. This is a very nice set of armor that has more added plastic to the pieces to give the larger trooper an opportunity to fullfill their dreams. Other armors geared toward the larger trooper at this point are RT-MOD, AP, and MTK. I have a 36 inch waist and I have plenty of room in my MTK. I know there are larger sized troopers out there that maybe can weigh in here. Do I know if you would be able to fit in armor with a 50 inch waist? No but maybe it can be done and maybe someone has already done it. If you have dreams of becoming a stormtrooper and fear that your waist size will prevent you from doing it then there is no other real motivation to start losing that weight. But I have no doubt that you will be able to do it if you set your mind to it. Good luck! Hey Tom, you can do this! I am 6'6" (1.98m) fridge build guy! And I think I look "impressive" good! Might be the all black armor! I got an AM 2.0 and with a lot shimming at thighs. I think its a great kit. If you're tall enough it'll work for you. I agree with Steve.. I'm a larger guy and have an AM2 armor. I'm very impressed with it and Have built 2 additional troopers in my garrison armor from the AM2 and we are all larger then a 34 inch waist, haha. Check with troopersupplies. I think he just did a run on armor and you can see when he is doing them again. Good luck. RT Mod and AM are the two biggest. I'm 5' 11'' and not small. My first choice was RT, but long story short I ended up with AM. AM does, or at least used to, make two different sizes- normal, which was already big, and large, which is even bigger. You might trim a ton in some areas, but you'll be perfect in others. I trimmed a lot off my forearms, but little off my thighs, for example. I can't for the life of me find the tutorial now, but there was one for working with the thigh armor on women. Basically, our thighs are bigger on top and smaller on the bottom, vs. men's are generally straight. So, when you cut your pieces to size, you don't do a straight line, but instead make a V cut, to account for this. It's subtle and not noticeable once completed, but it very much helps in the fitting and overall look when you're done. You do notice when it's complete it just looks off if the thighs are too big on the bottom. I want to say it was a LadyInWhite tutorial, it seems like something she'd do. If I manage to find it I'll edit this post with a link. I'm in the middle of an RT build and can answer just about any questions You have about the armor. See You next time You're in Anchorage.